My guess is we are about half way now. But it is impressive. It has been slow going doing the floor today - it is the hassle of the fact that garage floors are simply not level. They are not meant to be, they slope to the door, and ideally slope away from the house. This one has the added benefit of a slight bulge in the middle! So they have to plane and cut timer at the high points, and pack it at the rest to create a level framework. 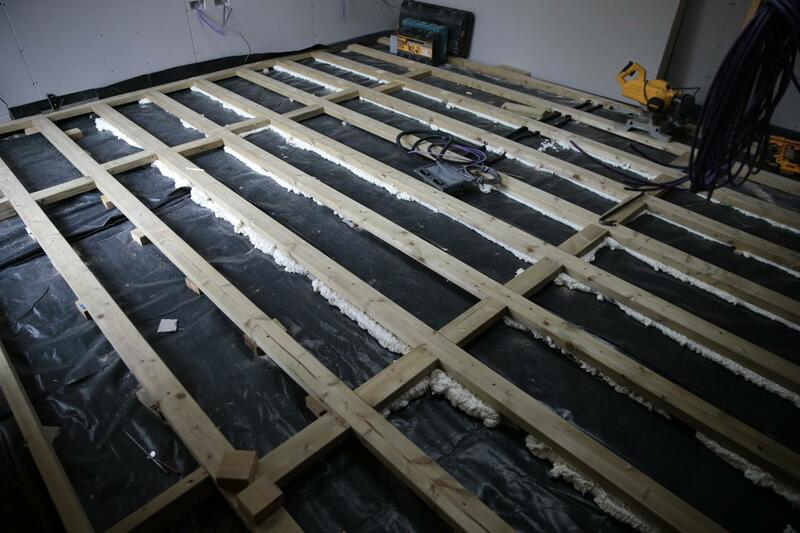 Then they screw it down in to the concrete and use filler on top of the membrane. 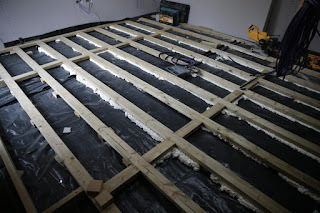 So tomorrow they finish the floor, with insulation and boarding, and the last bits of dry lining, and should have bricks to start on the wall. The plumber should finally come tomorrow as well. And I am going to see some doors at a joiner company. There is a lot more to do just to finish the structure, before we start on work bench, and so on. I am enjoying these build updates.